“I have a research paper due tomorrow morning,” I said aloud, startling everyone else in the movie theater who was watching Kevin Costner hit a golf ball. How could I have forgotten? It was 8:00 on a Sunday evening and I had an 8-page paper due in twelve hours. When I arrived home, I sat down in front of my computer and tried to think of a topic. My professor said our papers needed to be about technology in some way, shape or form. Glancing down at my desk, I saw the “World War I” research paper I had written for another class. “If only I could use the information I already researched for this paper,” I jokingly thought to myself. I would write a research paper about how the Internet has made writing research papers easier. I would write about two fictional students; one who used books from the library to do all his research, and one who used the Internet (“technology”) for his research. The research paper topic for these fictional students? World War I. It was more of a creative writing exercise than an actual research paper, but it was packed with historical quotes, dates, and facts. I wish I could tell you that karma punished me for my forgetfulness and procrastination, and my professor gave me a bad grade. I wish I could tell you that, but college is no fairy-tale world. My professor loved it. He gave me an “A” and said it was one of the best papers he’d ever received. The college version of Kevin, the procrastinator, would have loved blogging. With a little bit of ingenuity, it’s possible to take one post you’ve researched and written, and use it over and over. Note: This does not mean you can take a post you’ve published on one blog and republish it on a different blog. Don’t do that. Only evil bloggers do this. Are you evil? Of course not. Here are 4 ways you can take a post you’ve already written and repurpose it. Do you have a speaking voice that’s more Tracy Morgan than Morgan Freeman? Doesn’t matter. Do you look more like Adam West than Amy Adams? Doesn’t matter either. If you have a blog post filled with information, the hard part is already done for you. You can easily take the information in your post and turn into a short (1-3 minutes) script. Practice the script a few times. Record yourself using your webcam. Re-record yourself after you’ve removed the spinach from your teeth. Publish it to YouTube. Do you have a list post? Open Microsoft PowerPoint. Create a slideshow based on the points in your post (you can probably copy and paste 90% of it). Make it look pretty (this is the part which can take a little time, depending on your design skills and PowerPoint experience). Upload it to SlideShare. Because SlideShare presentations are created from PDF files, it means you can have links inside your presentations. On the last slide, have a strong call to action. Link to your blog or, even better, an opt-in page for your mailing list. You could copy the text of your post, paste it into Microsoft Word or Open Office, and save it as a PDF file. Or, even better, simply use PrintFriendly.com. A tip of the hat to Ana Hoffman of Traffic Generation Cafe for bringing Print Friendly to my attention. Why would you want to create a PDF version of the post? Well, for starters, as Ana points out in her post above there are directories in which you can submit PDF-versions of your posts. Some of these directories have Google PageRanks of 6 or higher. The primary reason you would want to create a PDF of your post is many of your readers prefer it. A PDF is something they can download and read on their Kindle. It’s something they can print and have handy. It’s something they can hold onto long after your blog goes the way of the dodo. Plus, if your PDF is particularly valuable or long (Example: You went temporarily insane and wrote an 8,317-word post), you can offer it as as incentive for readers to join your mailing list. Similar to the above, but with a little bit of extra work on your part. If your post is detailed, it can be hard for readers to easily digest it. Sometimes, a quick recap detailing the high points is invaluable. Open your preferred word processing document, and type a 2-to-4 sentence overview of the main points in your post. Be as clear and concise as possible. If your post offered actionable steps, be sure to include them. Save it as a PDF. Checklists are another incentive you can offer readers to join your mailing list. Want to make them especially enticing? Include an extra tip (or two or three) in your checklist which wasn’t included in your blog post. For readers who enjoyed your post, your extra tip is something they’ll want to know. Getting the most bang for your buck is a must for bloggers. If you have written something good, you need to find ways to repurpose it. What you wrote is awesome, right? Then why wouldn’t you want to stretch it as far as it can go? What’s your favorite way to repurpose content? Let me know in a comment below! Creative Commons Images via epSos .de. Great post. These are some great places to repurpose your content and the Slideshare thing is a really good one. I think I need to go over Ana’s tutorial again because while I do get some views on some of my presentations, I have a feeling I’m doing it wrong. So I’ll go and check that out. I never used PrintFriendly and will have to check that out. But PDF’s are a great way to go as well … even if you’re just submitting it free to forums. I try to create PDF versions of all my posts as well and submit it to the appropriate channels (leaving a CTA of course at the end of it) and I get alot of traffic from that as well. Good stuff. Looking forward to tomorrow’s post and you 5 day challenge. It’s been 3 weeks since I published a SlideShare presentation, so I really need to find the time to get a new one. I don’t know if it’s beginner’s luck or what, but I’ve had really good success with it so far. I haven’t tried submitting PDFs to forums/directories yet, but as you’ve seen on my blog I’ve started using them as mailing list enticements…. This weekend I’ve made the 8,317 PDF bonus my new lead magnet for my mailing list. My newsletter and 12-Week Blog Tip Series are still included for subscribers, but the 8,317 PDF is the new featured bonus. I’ll swap it out for something else in time, I’m sure, but given how well it’s done previously (when the ONLY way someone could get the PDF was to sign up while reading the post), it should do even better now that every page on my site is featuring it. But, we’ll see. Thanks for another great comment, Andrew. It should be an interest week of blogging! Your newbie Slideshare success was an incredible testimony to how powerful content repurposing could be, Kevin. Glad you finally get off your rear end to do it (and I am sure you are as well. lol)! Haha. Yes, I’m glad I got off my rear and dipped my toes into the SlideShare waters, too! Three presentations, three front-page features, almost 16k views. Not too shabby, right? Thanks for stopping by, Ana. Hope you have an awesome and blessed day. SlideShare is something I have been meaning to try for a long time and have never gotten around to it, so it’s good to see that you’ve had some success. Thanks for the reminder. You’re welcome. For someone with as large a catalog of content as you do, SlideShare is a great way to repurpose an old post. You can go find your best of the best, break it down into X-number of PowerPoint slides, save it as a PDF, and you’re ready to reach a whole new group of readers. I definitely need to find time next week to create another one. My first three were more than worth the minimal effort, I really should be publishing one every week or two. Thanks again, Marc. Have a good one. [ Smiles ] Hmm. The thought of implementing a Slide-Share in my blog never crossed my mind. Glad I sparked an idea. 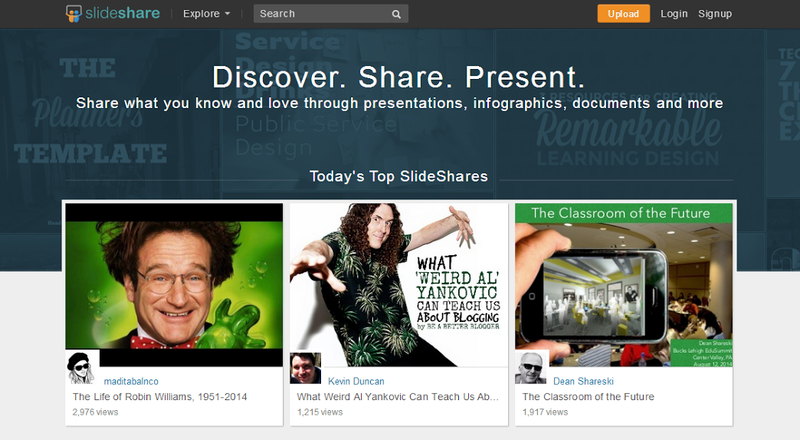 If you give SlideShare a try, I hope you have a lot of success with it! Have a great day, Renard. Anyway, I’m STILL horrible with repurposing my content. I started doing Slideshare presentations a few months ago and did pretty good but then I had a few posts that really weren’t that worthy of doing and I just got out of the groove once again and have not done another one. I’m going to do my usual complaining that it’s SO time consuming. It literally will either take me half a day or almost a whole day to just write the post so you can imagine how much time it would take me to do one or any of the above suggestions. Am I giving excuses? Probably, they sure sound like it to me but that’s my story and I’m sticking to it. Great suggestions though I agree. Now if I could 1) find time to do some of these methods and 2) get my you know what in gear! Thanks Kevin and enjoy your week. Congrats on your recent Slideshare success. I need to look at how you did that. I confess content creation is not my strongest suit. Time is my enemy! So I really appreciate these time saving tips. I dipped my toe into the Slideshare waters too. But haven’t given it the attention it deserves. With so little time for content my focus is: (1) my email list (2) my online communities (3) my blog and (4) everything else! Good to see you here again! Thank you. Yes, do check out my SlideShares (there are three of them) and let me know what you think. I empathize with time being your enemy. It’s mine, too, these days! So many blogging-related things to do, so little time! Hope you’re having a great week, Sally. I’ll make my way over to your blog this week, I promise. Great ways to re-purpose blog content Kevin. I’ve tried Slideshare and have had HUGE success with it. Many of my slides went on the “Hot” section. Then life got in and I have totally stopped doing slides recently. “pretty” and professional. The content doesn’t matter – that part is already done. But making those slides eye-catching and neat is a challenge. Yes, I still get traffic on the SlideShares I published, too. It’s like earning interest on money. Very awesome. Glad I was able to inspire you, Jane. Great to have you here, and I hope you have a great week! I have had a little success with Slideshare. Enough to know it is worth it. I have a couple PowerPoints I’m working on for it. They are re purposed content. I did a post about converting your blog post into Slideshares as well. My method has more of a copy and paste and it will be converted into slides but there’s no denying that 2 minute PDF! You mention Youtube and I know that platform is powerful but I have yet to dive in. I have some really interesting ideas for it so in the not to far future I will get into it. Re purposing content is a great way to spread our message multiple places. We definitely have to get diverse in the way we share our content to give max exposure. Thanks for this Kevin! You surely gave me some things to really consider like right now! Yes, I remember your post a little while back discussing SlideShare. I think I’m following you… aren’t I? Glad you liked the post, Steven! Hope you have an awesome day. I think you’re so awesome. I love the idea of doing slideshare presentations but I don’t have powerpoint… any other way to create them? I’m not familiar with the platform. Turning posts into youtube videos is a great way to repurpose or at least enhance the content… my problem is, my youtube channel has so much ADD I feel bad for my subscribers because there’s not much consistency. I’m not sure how much that really matters… I have too many interests, Kevin. That’s my fatal flaw, I admit it. What can you do? Awwww. Well, you’re too, too kind. Thank you. No PowerPoint? No worries! (Gosh, I sound like a infomercial spokesman…) You can use the free software OpenOffice.org to create presentations and save them as PDFs. Or, you create a free presentation in Google Drive and save it as a PDF. Having too many interests and too little time are my fatal flaws, so I can empathize. What helps me is compartmentalization. I have a professional Twitter, and I have a personal Twitter. I have a professional blog (this one), and I have a goofy-talk-about-whatever blog. This way… all my thoughts can still get out, but I just make sure they go to the proper place. You are awesome with how frequently, and how fast, you share my posts, Brittany. Thank you. I really appreciate it! Hope you’re week is off to a wonderful start! It’s my pleasure. I must confess I have a little help from my new BFF twitterfeed for all the sharing. I hope you do get a chance to check out my YouTube channel. I highly recommend my happy dance video and my “deep thoughts by Thomas” playlist if you do. I’ll have to see if I can manage a decent looking presentation on google drive, that’s definitely my home base. You’ll be the first to know if I do! All the tips you mentioned to put a new form to a blog post are quite tested and can be done with little effort. The main objective of repurposing a post is to make those read it in a different format who don’t want to read a lengthy discourse. Secondly it arouses interest of people into main content and you can achieve your ultimate objective of higher visitors at your blog post. There are two approaches about timing of repurposing. Once group of bloggers say it is wiser to repurpose soon after publishing your post and divert as much traffic as possible with all the tools of repurposing. The second school of thought advise to first calculate the response level to main content and then repurpose it to expand its outreach. There is no rule of thumb to follow which post and not which one but one thing is clear it did create a diverse impact on your brand and people come to know about your views through different tools. Thanks a lot for sharing this very wonderful post. This is an awesome post (although would I expect anything else from you Kevin!!). Some great ideas here, that I am going to try. I had never thought of putting old posts into a PDF before. Something I need to do! For bloggers there content once written is the collection of gold for them. They can use it whenever they want and you are right about repurposing the old post. Bloggers can make a YouTube video so that they can make people aware with visual content. It’s just the transformation of written content to visual content. Many people like to store their information in the form of pdf file so bloggers can make pdf file for their written content. You have given some useful tips to follow. Love the Repurposing topic because I was taught early on to start with the end in mind. That’s why I love video (not only because I’m a visual learner and prefer it). From a video, I can get a blog post, a downloadable PDF transcript, an audio and a slideshare. I do the work once,and can cater to different people because they have definite preferences as to how they would like to consume the content that interests them. If we provide several types, it stands to reason our engagement would increase. Starting with the blog post text and then reading it on a video is an interesting concept. I’m going to be starting a podcast which will sort of be like this, it will be a blogcast, where I read my content, making it interesting to listen to with some twists added and then upload to iTunes. On the back burner for now until I finish some projects. I need to increase my SlideShare presentations because these are fun and people really seem to enjoy them. When I offer a PDF version of my video post, it amazes me as to how many people download it. Someone told me it wasn’t just to read it but because he had very poor Internet connection and the video would buffer endlessly, so he wanted to be able to consume the content off line. I wouldn’t have thought that was a big pull, but apparently it is. Thanks so much for sharing these cool ideas, some I’ve already done, but you’ve given me new ideas too, so thanks!! Hi Kevin, Good post and valuable insight you have shared with us. Now I just have to work out how I can repurpose some old pig posts into nannas wisdom. At least I can now think about making a video of my pork pies, thank you. These are some really awesome tips for repurposing blog content. I went another step on this. I repurposed the whole of my old blog (no longer online), and turned it into a paid eBook (still online). It was perhaps one of the best things I have ever done online. To be fair, the blog wasn’t great and I was just learning, but instead of losing all the hard work, those blog posts became the spine of my eBook. I am also looking into repurposing older blog posts, and updating them with more up to date information. Great idea on the YouTube video – I have a bunch of posts that could easily be turned into a short video – or even a presentation. As you say, what we have all wrote should be stretched as far as it can, after all, it’s not easy writing a blog post so when it’s all done – of course we should be getting as much out of it as possible. I see you’ve made a start on your shorter post challenge. How you finding that? I’ve thought about Slideshare on many occasions, especially after reading Ana Hoffman’s case study, but I got stuck with the dimensions of the PP slides. Ana gives px ( or inches) in her tutorial (I think), and my PP is in cm. So, I soon got frustrated and went back to writing. I do like to include YouTube video’s in my blog post content, and that’s delivered some nice traffic back to the post it was part of. James Wedmore releases his new YouTube training this year, so I plan on putting a heavy focus on videos. Maybe repurposing my content will be a great starting point for that. Never occurred to me to create pdf’s though and that sounds like something that can be done without sucking up my time – may give it a try. You know already I am a fan of SlideShare, too. But I am probably far far slower than you with creating mine. It IS time-consuming for me, so I won’t be able to churn them out a quickly as you. My other fave for repurposing is creating a book from a series of blogposts. And then turning book chapters into guest posts for promoting the book. It requires a little planning so all content is fresh and uses different examples, but it can be done. You can change how-to’s into how-nots for instance. Kevin, you are not alone, my friend. I once wrote a 9 page paper the night before it was due, titled “How Procrastination Actually Helps us Socially & Professionally.” I got an A.
I’ve been putting off going through and re-purposing my old posts because, you know…I have eleventy-thousand things on my to-do list already (don’t we all?) but I know it needs to be done. And some just-plain-bad posts that I wrote when I was still figuring out my voice as a writer need to go altogether. I haven’t fully started the repurposing blog content for my site but i have see success from Slideshare, kudos to Ana Hoffman for that.. I will try an implement the orders point mention in this post and later come back an drop my testimony. I find this post very useful esp. to my co-bloggers who are looking for an inspiration to their new content. For me, I re-purpose my blog post by making it into an ebook (pdf file). But a question inside my mind arises, does the content of pdf file is searchable, readable or crawlable by search engines? The reason why I am asking this is because I don’t want my original or live content be tagged as duplicate content. Could you please enlighten me on this?